If you put a microphone underwater near the oyster reef in North Carolina's Pamlico Sound, you can hear it: a crisp, crackling noise that sounds like someone just dumped a ton of Rice Krispies into the ocean. But it isn't cereal making that noise - it's thousands of small creatures known as snapping shrimp. Researchers believe that their noisemaking habits could play several key roles within the reef, including serving as an auditory indicator of the underwater ecosystem's health. Snapping shrimp are primarily found in reef environments - coral reefs and oyster reefs, like the one in the Pamlico Sound. Only one to two inches in length, the shrimp live on the ocean floor and make their signature sound by rapidly closing the larger of their two asymmetrical claws. They can snap that claw at a speed of about 60 miles per hour. When they do, a giant cavitation bubble, or air bubble, forms. Then water rushes back into the air bubble, generating powerful energy and providing both a weapon for the shrimp and a loud snapping sound. Del Bohnenstiehl and David Eggleston are professors of marine, earth and atmospheric sciences at NC State. They study underwater soundscapes, including reef ecosystems. Former NC State graduate student Ashlee Lillis, now a postdoc at Woods Hole Oceanographic Institution, is interested in patterns in oyster reef sounds, because she believes that the natural background noise of the reef could play a key role in helping organisms, including larvae, find the reef. "We're not the only ones interested in reef sounds," says Bohnenstiehl, "but until now no one had sound samples from more than a couple of days or weeks at a time. If we're really going to explore the effects of sound on reef habitats and what that means, we need a longer sample." So Bohnenstiehl, Lillis and Eggleston took an entire year's worth of sound samples from the oyster reef in the Pamlico Sound. 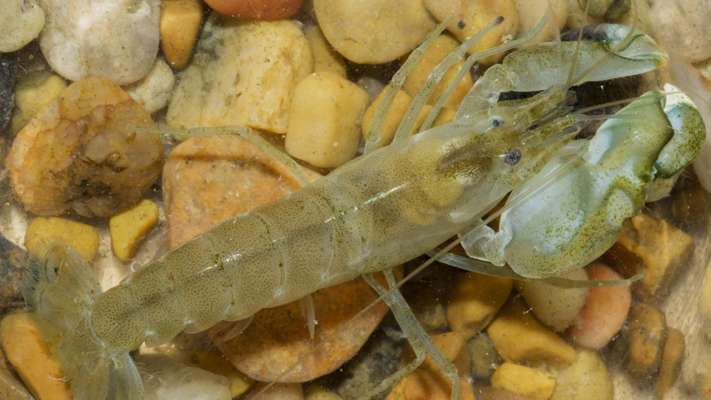 What they found contradicted earlier assumptions about the behavior of snapping shrimp being fairly constant. "There are seasonal differences in the level of sound, as well as differences between night and day," says Bohnenstiehl. "In the summertime, we got up to 2,000 snaps per minute - in the winter, it was 100 or fewer. The overall impact in terms of noise emanating from the reef is a difference of 15 decibels between seasons. We also found that the shrimp were more active at night during the summer, but more active during the daytime throughout the winter months." The researchers also found that the shrimp responded very quickly to changes in temperature, and that there was a difference in snap numbers between the summer of 2011 - when they started sampling - and the summer of 2012. "The data raises a lot of questions," adds Bohnenstiehl. "For instance, some research has proposed that the noise of the reef helps migrating fish navigate. But if the sound really drops off in the winter, does this still work? And could the difference in snap numbers between the summers be affected by water quality as well as temperature? This work highlights how little we know, and how important long-term acoustic sampling is in terms of understanding the marine soundscape." "The 'ecology of soundscapes' is an exciting and emerging field of study," adds Eggleston, "with broad implications ranging from the effects of sound on larval biology, to characterizing the health and biodiversity of habitats." The research appears online in the open access journal PLOS ONE.